Released in 1969, True Grit came during at transitional stage for American cinema. In the same year that saw the release of anti-establishment films like Easy Rider, They Shoot Horses, Don’t They?, The Wild Bunch, and Butch Cassidy and the Sundance Kid, John Wayne’s first and only Oscar win is seen as a last gasp of Hollywood’s old guard venerating one of their most indomitable figures. Indeed, the ultimate irony is that the same year Wayne – filmdom’s most emblematic cowboy – won Best Actor (for a performance that essentially amounted to self-parody), the X-rated revisionist Western Midnight Cowboy won Best Picture. The Coen Brothers conspicuously craft their 2010 updated adaptation of Charles Portis’ novel in a similarly progressive, oxymoronic vein: a traditional Western set during the twilight of the Old West. Between an opening scene that features an arrival by railway and an epilogue in which icons of the era are relegated to fodder for a traveling road show, there is a storyline about duty and honor driven not by men on horseback but a headstrong 14-year-old girl. After her dad is gunned down by a drifter named Tom Chaney (Josh Brolin), Mattie Ross (newcomer Hailee Steinfeld) takes the train to Fort Smith, Ark. to tend to her father’s affairs. Endowed with a steely countenance and a rapid-fire parlance, Mattie identifies her father’s body and barters over funeral expenses in the same breath. 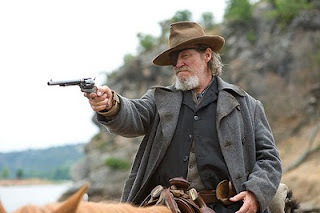 In her matter-of-fact mission to see justice served, Mattie hires an irascible, drunk, and one-eyed federal marshal Rooster Cogburn (Jeff Bridges) to track down and capture Chaney. She has one strict condition: She must accompany him for the hunt. Although the film is constructed like a conventional Western, the Coen Bros. pointedly eschew the romanticizing often applied in this genre. Money – not principle – is the primary motivation for Cogburn and LaBoeuf (Matt Damon), a preening, bounty-chasing Texas Ranger. The departed hold little value except to scavengers and bounty hunters. With an eye-patch, guttural growl and withered physique, Bridges’ Cogburn resembles John Wayne’s resurrected remains more than the Duke himself. By the time of the film’s setting, Cogburn is already a dying breed – LaBoeuf has only derision for his tales of Confederate exploits, and neither man quite knows what to make of Mattie. This is also one of the few Westerns that succeeds without a formidable and/or charismatic villain. When we finally meet the man who shot Frank Ross, he’s a scrawny nitwit situated on the bottom rung of even his own gang. Instead, True Grit focuses on three individuals who – as they traverse untamed terrain captured by Roger Deakins’ usual sumptuous lens – ascertain the true nature of each other’s character. The affinity Cogburn develops for Mattie is not born out of some paternal instinct, but rather his recognition and appreciation for her untainted determination. It is a trait Cogburn believed he’d lost long ago at the bottom of a whiskey bottle. When he literally carries Mattie across field and plain in search of safety, he’s not just trying to save her but the soul of a bygone age. That spirit will live on, but Cogburn discovers – as do we – that this is truly no country for old men.